WASHINGTON — Prime Minister Benjamin Netanyahu landed in Washington on Sunday for what amounted to a brief campaign swing through the White House, hoping that President Trump’s praise and latest gift — recognition of Israeli sovereignty over the Golan Heights — would persuade wavering voters that his diplomatic achievements should offset any worries about his integrity. 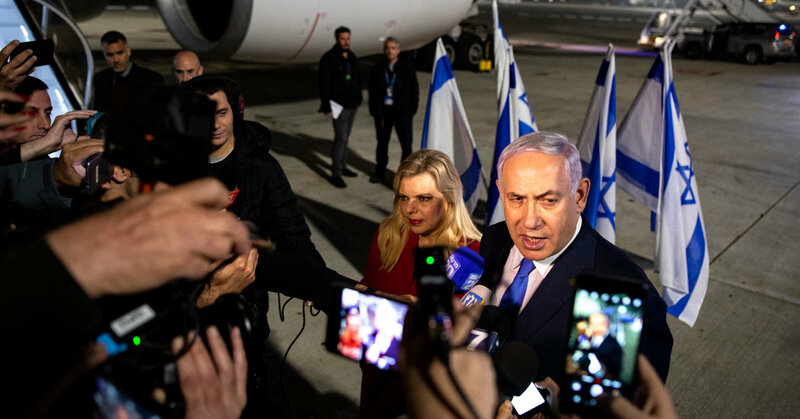 Yet with barely two weeks left until Israel’s parliamentary elections, in which he is running neck and neck with Benny Gantz, a retired army chief, a fresh new scandal has embroiled Mr. Netanyahu, delaying his flight to Washington by hours and dogging him even after he arrived. The first is that he improperly authorized the sale of advanced German-made submarines to Egypt without the approval of top military officials, possibly at a cost to Israel’s national security. The second is that he engaged in self-dealing, through an undisclosed and enormously profitable financial stake in a company that supplied the German builder of both the Egyptian subs and several new Israeli warships. The new scandal builds on an earlier one involving the multibillion-dollar purchase of submarines and missile boats from the same Germany manufacturer. In November, the police recommended charges against four of Mr. Netanyahu’s confidants, including his cousin and personal lawyer, over corruption in buying the ships. Mr. Netanyahu was not named a suspect. But state prosecutors are said to be considering opening yet another investigation over the latest revelations. He insisted that his investments had been unrelated to his role in buying submarines for Israel, and that he had sold his stock in the company before those deals were made. Far from putting the matter to rest, however, the 40-minute television appearance confirmed much of the recent reporting on the submarine scandal and raised troubling new questions. Mr. Netanyahu confirmed that the company on whose shares he had turned a sevenfold profit, clearing more than $ 3 million, a year after returning to power as prime minister, was in the supply chain of the German shipyard that builds Israel’s submarines. He admitted, after dodging the question for some time, that it was he who had told the Germans that Israel would not object to the sale of advanced submarines to Egypt. And he acknowledged keeping both Mr. Gantz, who was then the army chief of staff, and Moshe Yaalon, then the defense minister, out of the loop about that decision. Mr. Yaalon is now the No. 2 candidate of the Blue and White party. Mr. Netanyahu asserted that the decision not to object to the sale of submarines to Egypt was based on “state secrets” that justified his failure to consult either the military chief of staff or the defense minister. But in Washington on Sunday, Mr. Gantz dismissed Mr. Netanyahu’s state-secrets assertion as ludicrous. This was not the story line Mr. Netanyahu was aiming for as he headed to Washington. His trip had been carefully orchestrated to remind Israelis, who overwhelmingly admire Mr. Trump, of how effectively Mr. Netanyahu has managed their relationship. At their Monday meeting, Mr. Trump is expected to sign a document formalizing the United States’ recognition of Israel’s sovereignty in the Golan Heights — a strategically important plateau that Israel captured from Syria in the Arab-Israeli War of 1967 but which under international law is considered occupied territory. As an added bonus, the White House meeting is to take place on the same morning that Mr. Gantz takes the stage across Washington at the annual gathering of the American Israel Public Affairs Committee, ensuring that Mr. Gantz’s big debut there is utterly eclipsed. Mr. Netanyahu’s early departure means that he will abandon plans to take his turn addressing the Aipac meeting on Tuesday, and he will miss talks with congressional leaders and a dinner at the White House with Mr. Trump. Liberal Jews who object to Mr. Netanyahu’s policies and who are concerned that Israel is becoming a partisan issue in the United States, had been pointing to his appearance as a chance to protest. T’ruah, a rabbinical human-rights advocacy group, urged Jews attending the Aipac conference to walk out on Mr. Netanyahu’s speech, while a prominent rabbi, Rachel Timoner of Congregation Beth Elohim in Brooklyn, on Friday called on Democratic leaders to “sound the alarm against” Mr. Netanyahu’s policies from the Aipac stage. could, Lands, Moment, Netanyahu, scandal, U.S.